Teenagers love their jeans and casual wear options. Skinny, flare, boot cut, foil-wash, waxed – these are the pants teens and many adults live in. 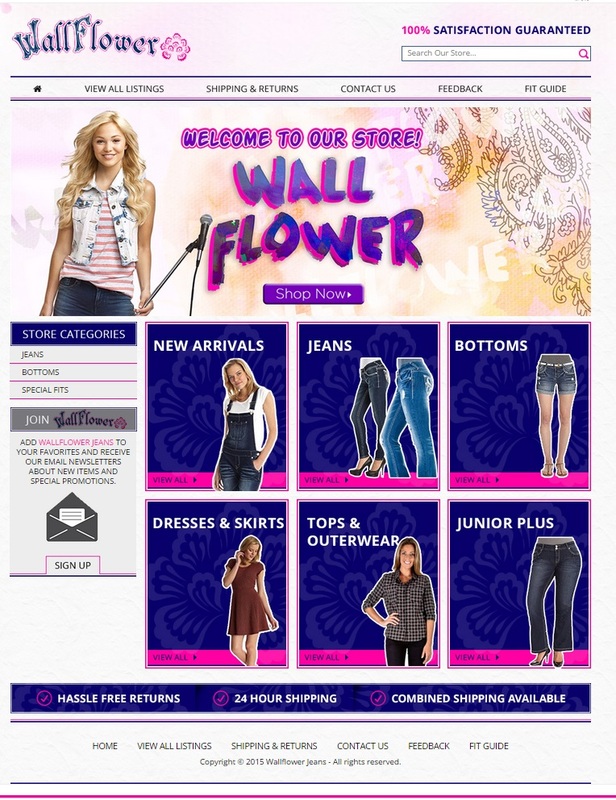 When WallFlower Jeans approached OCDesignsonline for help with creating a new eBay clothing store, we were happy to step in and help. We really had fun with this one! We took our inspiration from WallFlower’s products, target market, and logo. We wanted everything about this custom eBay store to say “fun” and “playful.” We used the colors from the logo throughout the site, and we used some fun background effects to liven things up. We even used the company name in a watermark style to bring interest to the background. We started by including the logo, a search bar, and the brand’s 100% satisfaction guarantee at the top of the store. Then, we made sure that the menu looked nice, and would direct customers to the answers they were looking for. Our client included a fit guide, which is very helpful for businesses selling clothing products. Underneath the menu, the header image has a paisley background and a young woman with a microphone in her hand. It all works together to say that this brand is anything but a wallflower. We used cutout images on backgrounds that coordinate with our client’s logo to depict the different types of products that our client offers in this eBay store. We outlined the cutouts with white to really make them stand out – and to make the whole collage of categories playful and youthful. We think it’s great fun – like when kids cut out images from magazines and glue them to white paper backings to make paper dolls. We wanted everything to coordinate, and we wanted customers to know where they were when they were browsing the site. Thus, we made sure all the category search pages had the same branding and styling as WallFlower’s homepage. In addition to carrying the branding through on these pages – we also created special listing templates for our client. This way, customers’ questions could be answered in the same place as the items they are thinking about ordering. This helps to boost sales and it helps to build a repeat customer base. At OCDesignsonline, we have a wide array of eBay listing templates from which to choose. Take a moment to browse our portfolio and when you find something you like, request a free quote. Also, don’t forget to find us on Facebook, Twitter and Google+!